By Michael Collins: Former NABF light heavyweight champion Denis Grachev (12-1-1, 8 KO’s) was having a hard time coming to terms with his 12 round unanimous decision loss to former IBF super middleweight champion Lucian Bute (31-1, 24 KO’s) last Saturday night at the Bell Centre, in Montreal, Candada. Grachev, 30, felt that he lost no more than four rounds at the most despite the fact that he was getting hit with the better shots and not doing enough against the defensive-minded Bute to win. I had Grachev winning three to four rounds, but I couldn’t give him 8 or 9 rounds without ignoring all the jabs and left uppercuts that Bute was nailing him with all throughout the fight. If you ignore Bute’s nice shots then you can give Grachev 9 rounds easy. However, that’s not how boxing is. It’s natural that Grachev isn’t happy about losing the fight, but he needs to sit down and watch the fight again to see how he failed to do the things he needed to do in order to win. It wasn’t Bute at his best agaisnt the slow-handed Grachev, but he fought a smart fight against a guy with good power. Bute wasn’t going to take a lot of chances against Grachev because he saw what he had done against Ismayl Sillakh in his last fight and he wasn’t going to take any chances that Grachev could land the same big shot against him to get a win. Grachev did stun Bute with a hard right hand in the 5th, and Bute acknowledged that after the fight. However, Bute was smart by holding onto Grachev to keep him from throwing anything additional to try and finish the job. This was what was missing in Bute’s loss to Carl Froch last May. 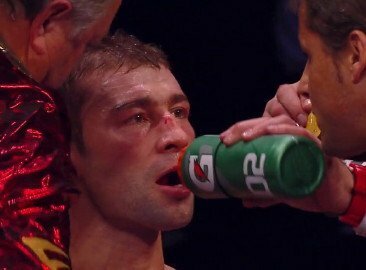 In that fight, Bute got hurt early on but instead of looking to hold Froch, Bute backed up to the ropes and tried to fight it out. It was a foolish mistake and it ultimately cost him the fight.